Working with plants is how I got into food growing, and it’s still where I am most comfortable and confident in my homesteading skills. Growing gardens and orchards is actually, truly not about the plants so much as it is about the soil and the life that lives there. Tend your soil, it will tend your plants. A light bulb went on for me at a NOFA summer conference years ago hearing NY farmer Steve Gilman say something like: I am not a plant grower but a microherd rancher. The importance of soil has become more recognized and understood as the key to plant health, especially as we move away from chemical agriculture. 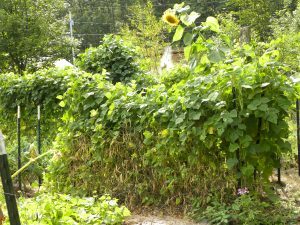 Permaculture taught me some skills that have made my gardening much more successful and a lot easier. 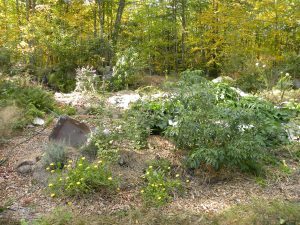 Building soil with sheet mulching and hugelkultur is the foundation. We didn’t really have enough soil on this property for growing – we have to make it with these techniques. 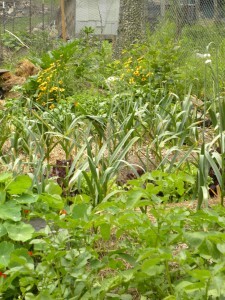 I also learned to stop tilling and keep the soil covered from permaculture and NRCS. 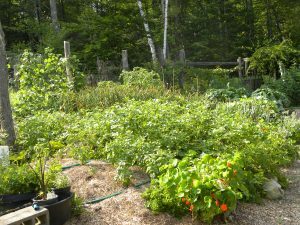 I have a chemical free garden – I’ve never used a synthetic fertilizer, or a pesticide or herbicide – not even organically approved kinds. We have seen very little disease, and only have a few pest problems. I do use row cover for some of my kale crops to keep the cabbage moths and their wormy offspring from surprising me in my broccoli dishes. Otherwise, living with some damage, and doing some handpicking (for later feeding to the poultry usually) works fine. 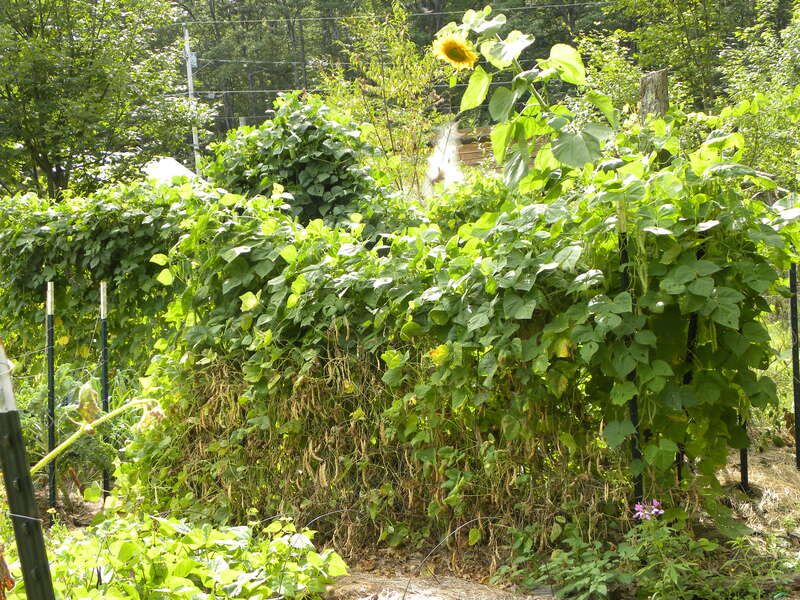 I probably weed for 1 hour a year – I am serious about mulching the garden instead! I am also getting more into cover crops and trying out some living mulches, especially in our perennial plantings. We have an annual garden that provides most of our vegetables for the year. We are also establishing perennial vegetables and diverse orchards. Here are a few crops we grow: persimmon, peach, pear, azarole, cornelian cherry, nanking cherry, goumi, siberian peashrub, jostaberry, honeyberry, gooseberry, various currants, hardy kiwi, comfrey, nettles, asparagus, Solomon seal, sunchokes, lots of herbs and annual veggies, and drying beans. Our goal is to grow for our animals as well, especially for the winter. For instance, dried beans, sunflower seeds, winter squash, root veggies, kale, and cabbage.